Utz has announced the launch of Crab Cheese Balls. 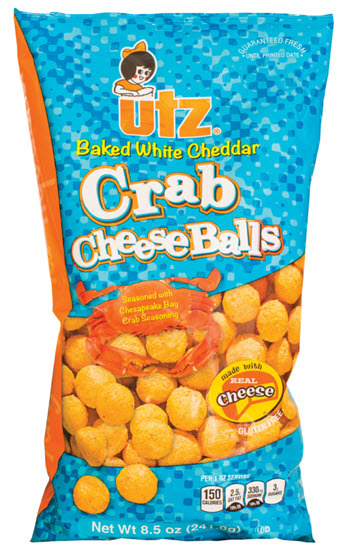 The cheese balls are the latest addition to the Utz crab snack line. They feature Chesapeake Bay style crab seasoning. Jeff Martin, executive vice president of sales and marketing at Utz, says in the announcement, "With the continued popularity of our Utz Crab Potato Chip offerings, we wanted to go further in providing consumers with what they demand, more ways to enjoy crab seasoned snacks. Pairing our popular Chesapeake Bay style seasoning with our famous cheese balls has made for a perfect combination." The Crab Cheese Balls have 150 calories, 3 grams of sugar and 16 grams of carbs per 1 oz (about 28 balls) serving size. The snack is sold in 3.5 oz. and 8.5 oz. sizes. They can be found in grocery stores and online at getutz.com.